Despite all of this, the United States Soccer Federation (USSF), which oversees the men’s and women’s national teams for international competition, pays winning female soccer players only a fraction of the compensation it pays to losing male players. In response, 28 current members of the women’s soccer team—including superstars Alex Morgan, Megan Rapinoe and Carli Lloyd—filed a federal class-action pay discrimination lawsuit against the organization on International Women’s Day. According to court filings, the women earn only 38 percent of what the men earn, and performance bonuses are even more skewed. In 2014, the USSF gave the men’s team performance bonuses totaling $5,375,000 for losing in the Round of 16, but in 2015 provided the women’s team with only $1,725,000 for winning the entire tournament. Due to their winning record, the women’s team also played 19 more games than the men’s did between 2015 and 2018—an equivalent of more than one additional men’s team calendar year season over that time period. In other words, the women are working significantly more than the men and outperforming them—but still earning significantly less. 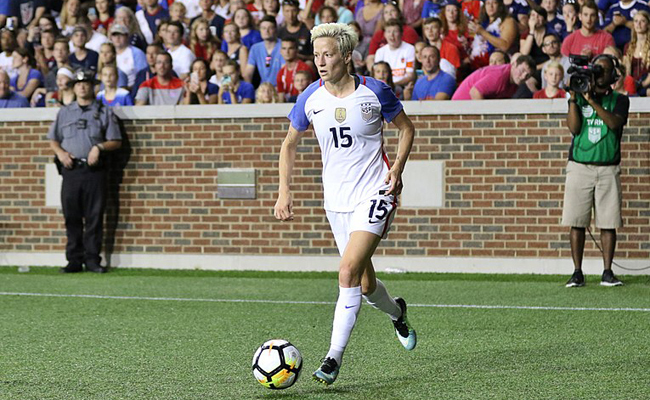 USSF claims that female athletes deserve less pay because their games produce less money, but the players allege that they were paid less even during times when they earned more profit, played more games, won more games, earned more championships and/or garnered higher television audiences than male players. According to the complaint, USSF made more than $17 million in unexpected profit in 2016, largely due to the women’s team, yet still payed female players less than the male players. The USSF also sets ticket prices to the women’s games lower than the men’s games, and provides substantially less marketing and promotion support to the women’s games, resulting in what they called a “USSF-manufactured revenue depression,” and USSF then used as a “pretext for lower compensation” for the female athletes. Tens of millions of dollars in public subsidies have financed and promoted men’s soccer for years, and the media promotes men’s teams more as well. Women’s sports receive only 4 percent of all sport media coverage, despite women being 40 percent of all sports participants. This “historical and cultural baggage,” argues Zimbalist, contributes significantly to overall revenue differentials between men’s and women’s sports and under-investment in women’s teams. In addition to pay discrimination, the female players also allege that the USSF discriminates against them in “nearly every aspect” of their working conditions, including playing, training and travel conditions and promotion, support and development for their games. From 2014 to 2017, the women’s team played 13 times on artificial turf, which is more likely to cause injuries, while the men played on turf only once. The USSF was also more likely to charter private planes for the men’s team while requiring the women’s team to take commercial flights. In 2017, the USSF chartered flights for the men’s team on seventeen occasions, while failing to do so even once for the women’s team. Spectacular athletes. GIve them equal pay and rights. Thanks. Football is a notoriously male dominated sport so time to change. The same issue arises in tennis but the ladies play three sets and the men play five. If the effort is equal the pay should be equal.